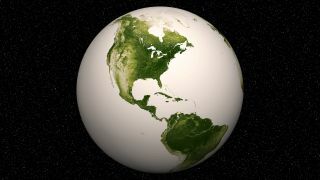 NASA and NOAA satellites measure vegetation on Earth from space to produce images like this one of plant life between April 2012 and April 2013. The rise of plants was crucial in turning Earth from a watery rock into a world where humans could thrive — and our home may not be the only planet where that process has played out. So scientists decided to investigate Earth's own vegetative history to think through how it could guide our search for habitable exoplanets. The result is a new paper that focuses on what scientists call the vegetation red edge, which just means that Earth happens to reflect back a relatively high amount of near infrared light. The pair of scientists behind the new research looked at how Earth's vegetation red edge as viewed by an alien would change over time as plant life evolved and changed. The first green plants, like mosses, produced a very weak vegetation red edge signal. But now, 400 or 500 million years later, modern plants and trees produce a signal that's about twice as strong. They also feed, house and clothe humans and plenty of other life-forms. "Our work shows that as plants evolved on Earth, the vegetation signal that reveals their presence became stronger, making older exoplanets really interesting places to look for vegetation," Kaltenegger said in the statement. And the researchers estimate that the signal will become even more noticeable if Earth continues to become warmer and drier, since cactuses are particularly reflective of this near infrared light. For hopeful astrobiologists, that's not all bad news, since even today, Earth's vegetation red edge would be difficult to catch a glimpse of. But even taking into account different types of plants and partial cloud cover, the scientists found that Earth looks reliably different from other planets in the solar system — a promising sign for using the technique. "Observing an exoplanet is more challenging, but telescope technology is getting better at spotting tiny signals," co-author Jack O’Malley-James, also an astronomer at Cornell University, said in the statement. "And factoring Earth's changing landscapes into our models will make it easier to detect vegetation in the future on other worlds." The research is described in a paper published Sept. 12 in the journal Astrobiology.